surgical puncture of a vein; see illustration. Needle placement during venipuncture. To obtain good blood flow, the needle is positioned correctly in the vein lumen. The needle should not rest against the upper wall of the vein or puncture through the vein wall on the opposite side. From Malarkey and McMorrow, 2000. The puncture of a vein, usually to withdraw blood or inject a solution. /veni·punc·ture/ (ven″ĭ-pungk´chur) surgical puncture of a vein. Puncture of a vein, as for drawing blood, intravenous feeding, or administration of medicine. the transcutaneous puncture of a vein by a sharp rigid stylet or cannula carrying a flexible plastic catheter or by a steel needle attached to a syringe or catheter. 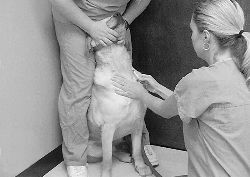 It is done to withdraw a specimen of blood, perform a phlebotomy, instill a medication, start an IV infusion, or inject a radiopaque substance for radiological examination of a part or system of the body. Also spelled venepuncture. method The specific steps in performing a venipuncture vary with the purpose of the procedure and the equipment to be used, but in most instances it begins as follows: The nurse dons disposable gloves. 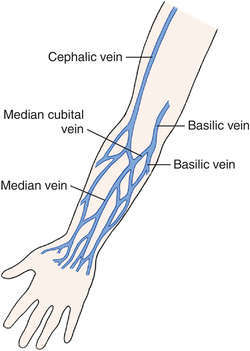 A convenient vein is selected, usually on the outside of the forearm, on the back of the hand, or in the antecubital fossa. The vein is palpated, and to dilate the vein a tourniquet is wrapped around the arm proximal to the intended site of puncture. After cleansing the intended insertion site, the examiner avoids touching the site with the gloved finger(s). The vein is immobilized by applying traction on the skin around the puncture site. The stylet or needle is held at an angle of 30 degrees for direct venipuncture. In performing direct venipuncture, the tip of the needle is pointed in the direction of the flow of blood and advanced through the skin directly into the vein. The tip is usually inserted bevel side up; however, if a large-bore needle must be used in a small vein, it is preferable to insert the needle bevel side down because it is less likely to perforate the posterior wall of the vein. After the skin is punctured, little resistance is felt as the tip passes through the subcutaneous tissue, but a sudden slight resistance may be felt as the tip hits the wall of the vein. At this point the tip is cautiously advanced, with the needle or stylet held nearly flush with the skin. Slight upward pressure aids in keeping the tip in the vein as it is advanced into the lumen of the IV space. Blood flows back into the hub of the needle or into the catheter attached to the needle or covering the stylet, and the tip of the needle usually can be felt to be in the vein. If these signs are absent, the tip is not in the vein, in which case it is usually best to remove the needle or stylet, apply pressure to the puncture site, and start the procedure again, using new equipment. interventions Wing-tipped "butterfly" needles, various kinds of intracatheters, and single or multiple venipuncture needles require familiarity and practice for correct insertion and stabilization. A sterile dressing and an antimicrobial ointment are applied over the insertion site. The cleansing agent used to prepare the injection site may be iodine, povidone-iodine, or ethyl alcohol. If an iodine preparation or solution is to be used, the patient is first asked about any previous allergic reaction to iodine. To aid insertion of the tip into the vein, the patient may be asked to clench the fist to further dilate the vein. The use of the gloves helps to protect the health care worker from inadvertent contact with the patient's blood. outcome criteria Aseptic technique is required to avoid infection. A quick, skillful insertion is nearly painless for the patient. 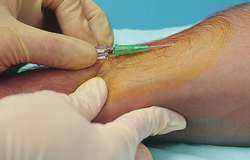 Specific sequelae to venipuncture vary with the techniques and equipment used. See also intravenous infusion, phlebotomy. The puncture of a vein with a needle with the intent to either obtain blood or administer a therapeutic substance. See Phlebotomy. Cf Cut-down. Puncture of a vein, typically to obtain a specimen of blood. The pain of venipuncture may be diminished by several methods, including application of cold to the area just prior to the puncture; injection of sterile, normal saline intracutaneously to produce blanching of the site; and use of a local anesthetic to produce a wheal at the site. The puncture of a vein, usually to withdraw blood. n surgical or therapeutic puncture of a vein. surgical puncture of a vein. Magnesium sulphate anticoagulated blood samples can be used for platelet counting, when platelet count in EDTA blood sample do not match with clinically, or flagging in haematology analyser, as suggestive of platelet aggregates. Tiwari's blood samples were collected on Tuesday after a team of doctors reached his Dehradun residence on the order of the Supreme Court. His last ditch effort to get relief from the Supreme Court also failed last week, as the apex court dismissed Tiwari's claim on May 24 that he was too old to give a blood sample. A doctor and nurse took the blood samples from Rohit ( 32) and his mother in the chamber of the joint registrar Deepak Garg in the presence of Tiwari's counsel. Blood sample from cupping showed highly significant decrease in low density lipoproteins level i.
immediately upon collection, often it is not possible, especially when blood samples are collected from remotely located farms. The group, headed by Yoshinao Katsumata, a professor at Nagoya University, said that in experiments amounts of ethanol were found mixed with blood samples producing readings indicating the driver was slightly drunk up to heavily drunk. To check this out, doctors got two blood samples from 235 children seen at a downtown clinic in Milwaukee. As per the directives of the Supreme Court, Tiwari would give his blood sample at his residence in Dehradun on Tuesday in the presence of district Judge and a high court registrar. This is especially true when collecting blood samples from patients with difficult venous access (DVA), where the blood flow is compromised due to low pressure or narrow vessel diameter, making it difficult or impossible to collect a sufficient blood sample. A blood sample was collected from the patient on December 7; anticoagulation was accomplished with ethylenediaminetetraacetic acid (EDTA) for repeated biochemistry analysis and complete blood count. The researchers took a blood sample from each man and checked for signs of heat trouble.